Volkswagen’s I.D. 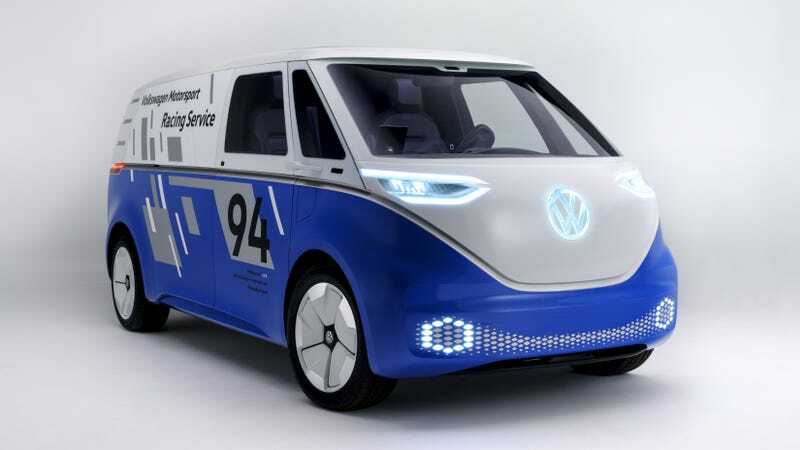 Buzz Cargo concept is making its auto show debut in Los Angeles this week and, in many ways, it answers a question the market has been asking for some time now: Why shouldn’t cargo vans all be electrics? So-called range anxiety has been the stumbling block for electric vehicles for some time now, as charging infrastructure is just not there yet in the U.S. and other parts of the world, and consumers want the ability to drive without worrying about running out of juice. I think this anxiety is largely misplaced, as most people don’t drive more than 100 or 150 miles a day, and many of today’s electrics can do that on a single charge. Electrics make even more sense in the realm of delivery vehicles, especially in urban environments where delivery trucks make lots and lots of short trips. Enter the I.D. Buzz Cargo, a version of which Volkswagen first showed off last year. It’s now in L.A. and, Volkswagen said Tuesday, could be launched by 2022. I wouldn’t bank on that, but the I.D. Buzz Cargo does do a lot of things right, and is the direction we should be heading. The interior has been tailored for commercial use, down to the smallest detail. Instead of two single seats in the front, the concept vehicle is equipped with a driver’s seat and a double bench-seat on the front passenger side. The middle seat can be folded down to open up a workspacewhere the driver can use an integrated laptop. In the automated “I.D. Pilot” mode,this can even be done on the move. The driver activates the autonomous mode by simply pushing on the steering wheel for a few seconds, which then retracts into the instrument panel. Then the driver’s seat can be turned 15 degrees to the right, enabling the on-board computer to be operated from the ideal ergonomic position. The cargo compartment begins behind the first seat row and a bulkhead. In cooperation with the German equipment specialist Sortimo, a shelving system with sensors has been developed for the cargo area. This shelving system is connected to the vehicle via a customer-specific function control unit and a CAN interface. The data is transferred by WLAN to tablets in the cargo space and cockpit. By means of a mobile radio network, the functional control unit might communicate with a company’s job or order-management system, theoretically making it possible to track all articles on the shelves. This enables precise online management of the type and quantity of freight and equipment in this futuristic Transporter. I love all of this, and it’s nice to see to that the VW minivan is getting back to its roots, since before it was the preferred ride for hippies, the microbus was for cargo first and foremost.